Best Movie of the Decade? The reason i believe is something I heard from Chris Connelly and that TV is the new indie movie. Shows like The Soprano’s, Band of Brothers, The Wire, and Mad Men – those are the best movies of the last decade. Granted they didn’t come out on the big screen but this is where visionary directors are going to produce character-driven creative stories. Cinema today is all about either (1) Big budget action movies or (2) formulaic stories in a specific genre whether it’s horror, comedy, romance, or thrillers. It’s interesting to see that TV is picking up the slack that films are leaving. This could also be why people are picking up TV DVD’s much more. The production quality, the music and the cinematography is way better in these tv dramas than they ever were in 80’s and 90’s television – it’s no wonder that they can compete head on so well. 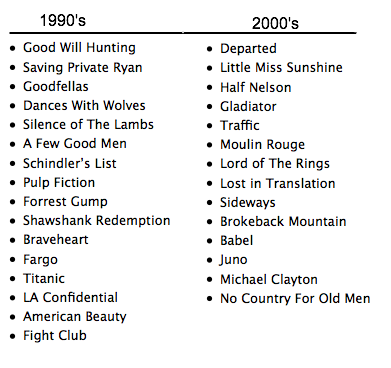 Personally, if i had to pick, i’d choose The Departed or No Country For Old Men as the best movies of the 00’s. What do you think? First, what is your top movie of the past decade? And do you agree that TV is the new Indie film?